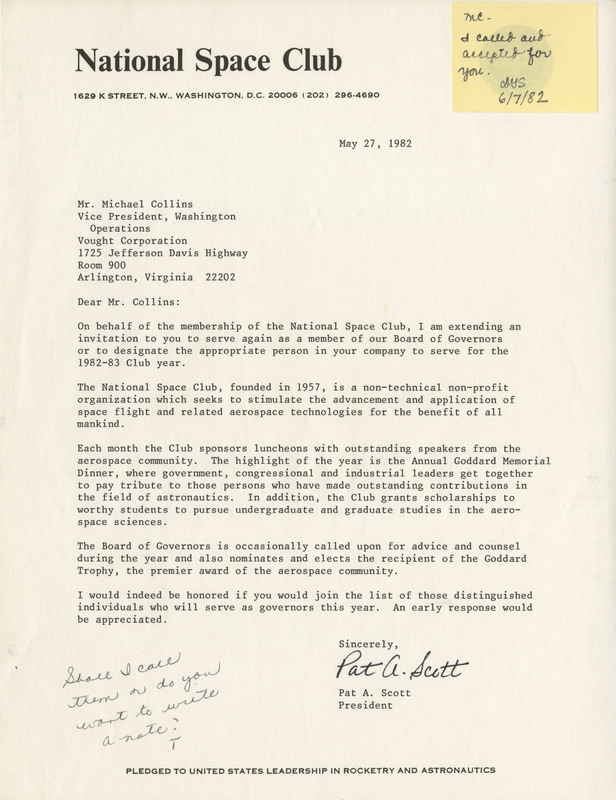 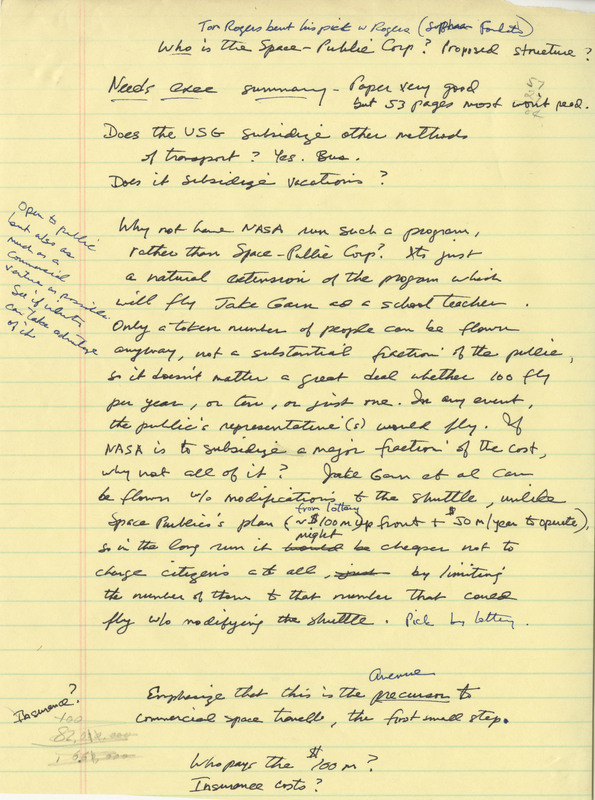 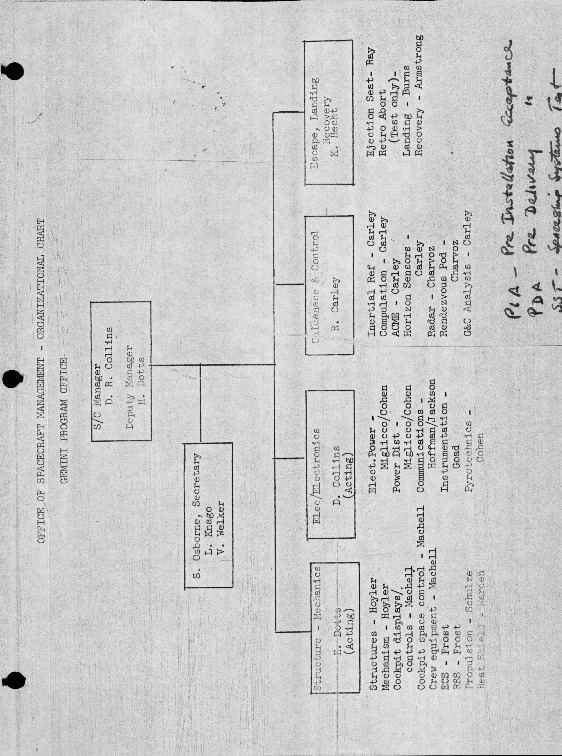 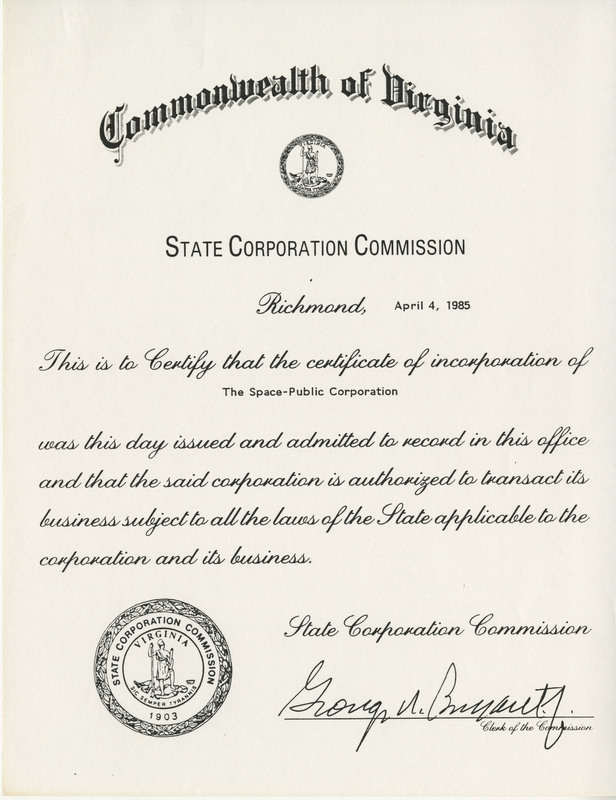 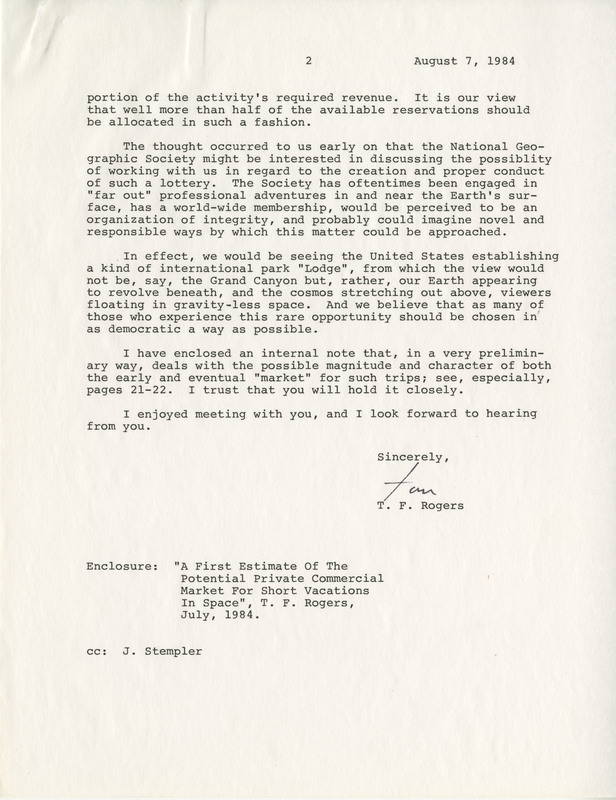 The collection includes the papers of Michael Collins--pilot, astronaut, assistant secretary of state, director of the National Air and Space Museum and author, dating from 1907-2004. 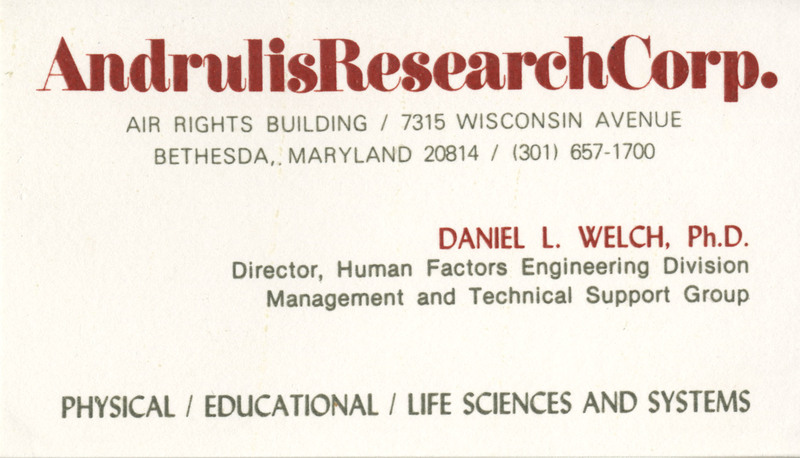 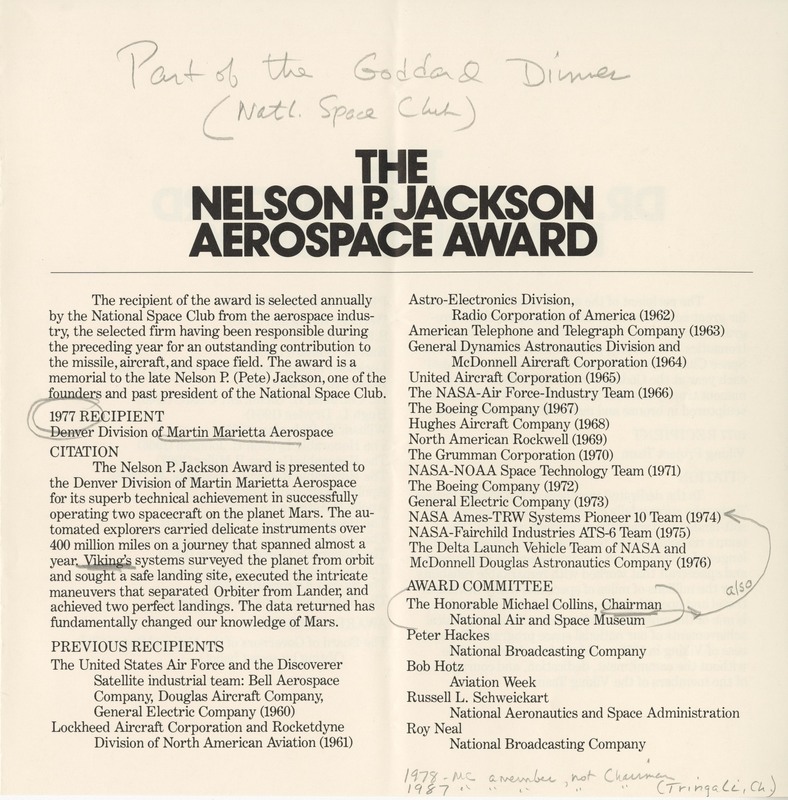 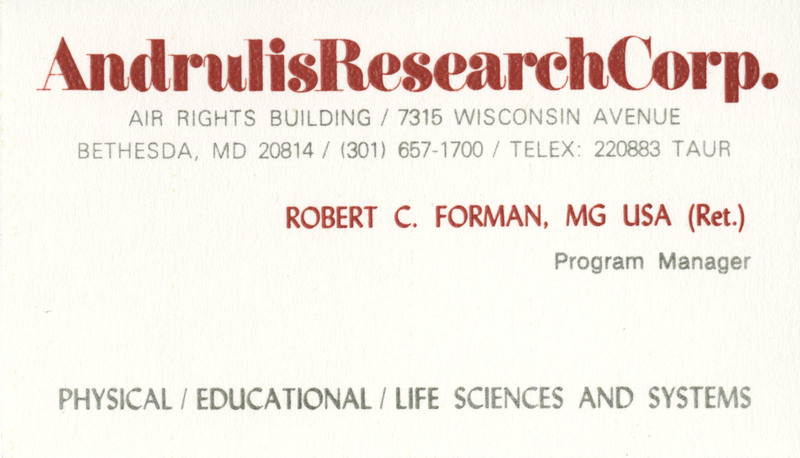 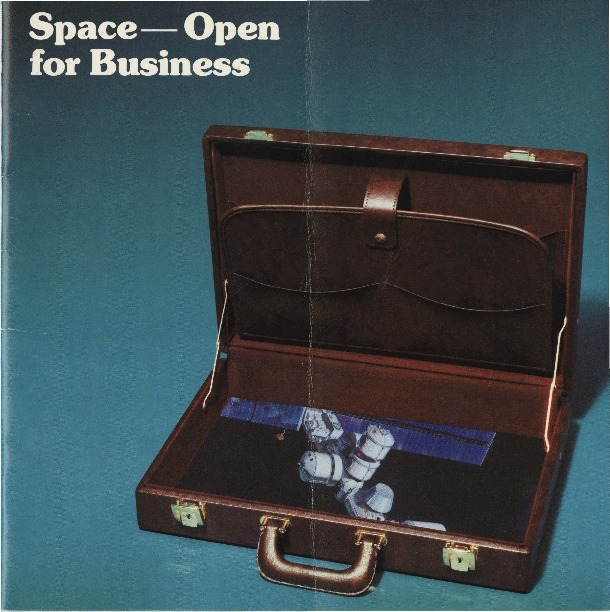 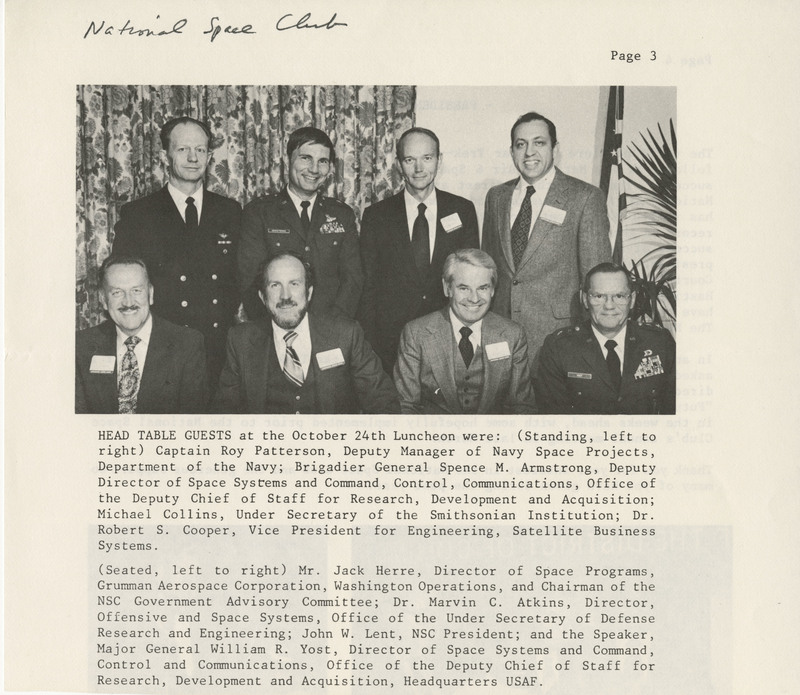 Materials include reports, instruction manuals, personal notes, printed materials, audio recordings, photographs, awards and memorabilia associated with Collins' Air Force, NASA, State Department and NASM careers. 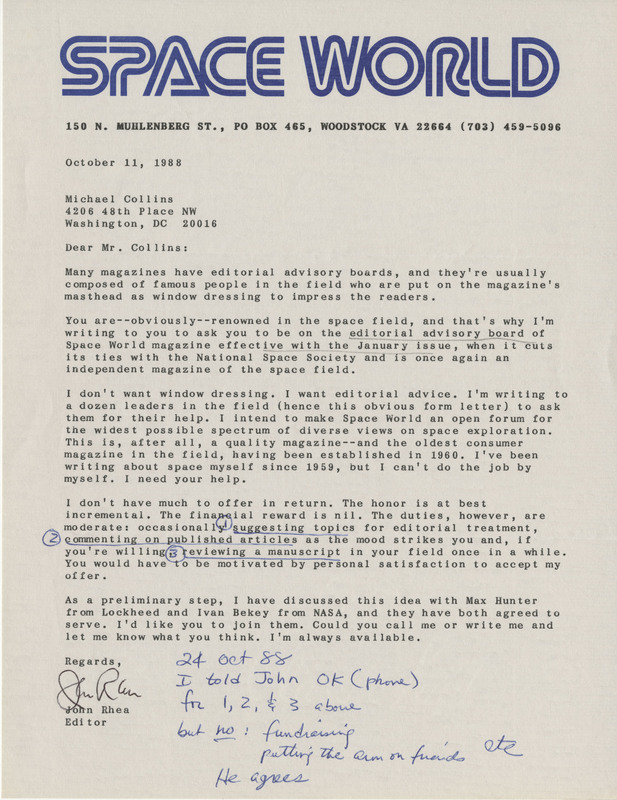 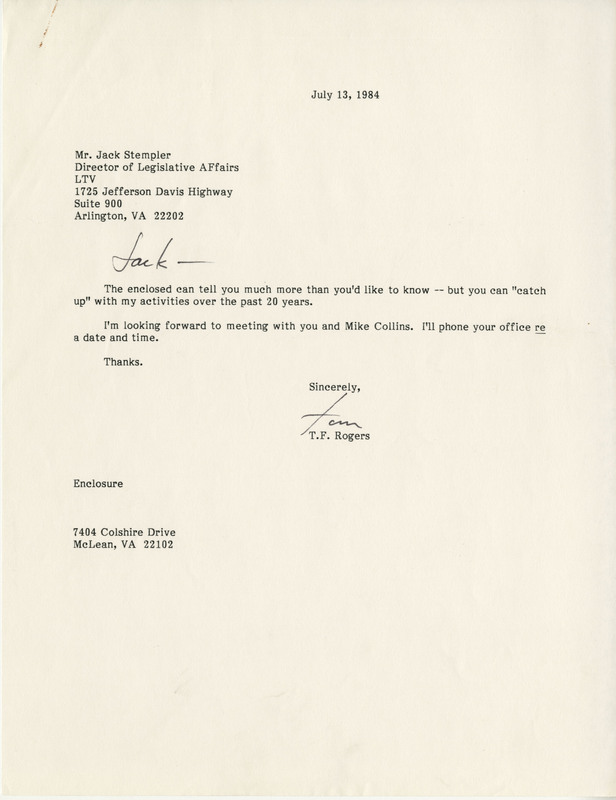 There are also papers and research relating to Collins' writings; materials from public speaking engagements and board and club memberships; and small sets of personal correspondence and biographical material. 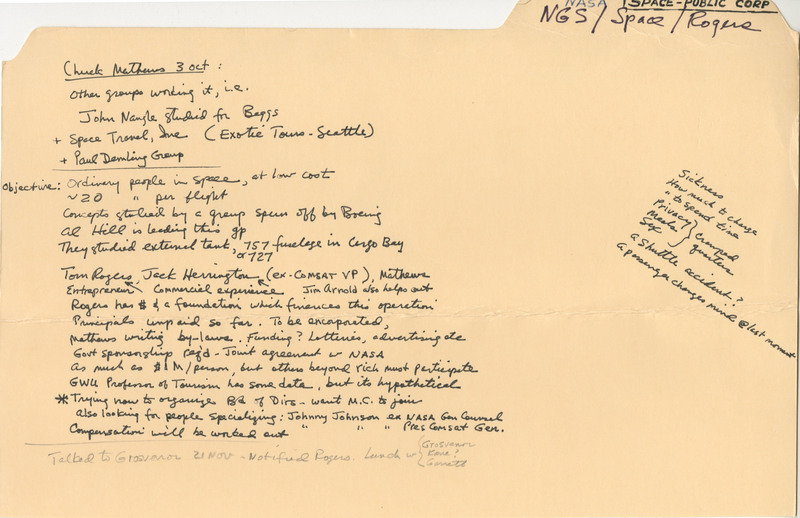 Permission to publish material from the Michael Collins Papers must be obtained from Special Collections, Virginia Tech. 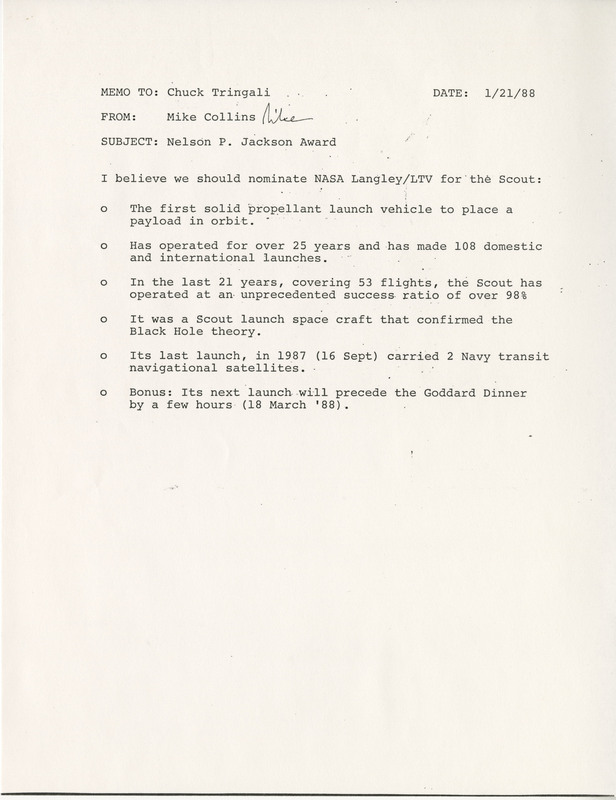 Researchers wishing to cite this collection should include the following information: Michael Collins Papers, Ms1989-029, Special Collections, Virginia Polytechnic Institute and State University, Blacksburg, Va. 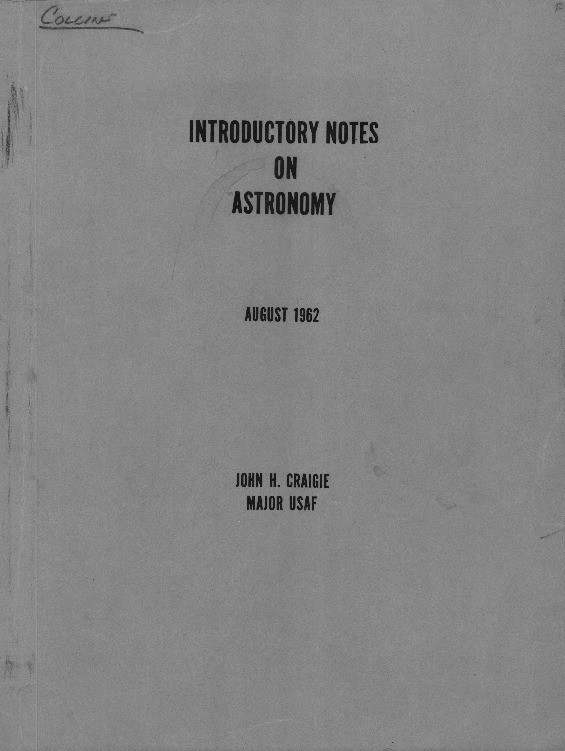 Introductory Notes on Astronomy Handbook, August 1962. 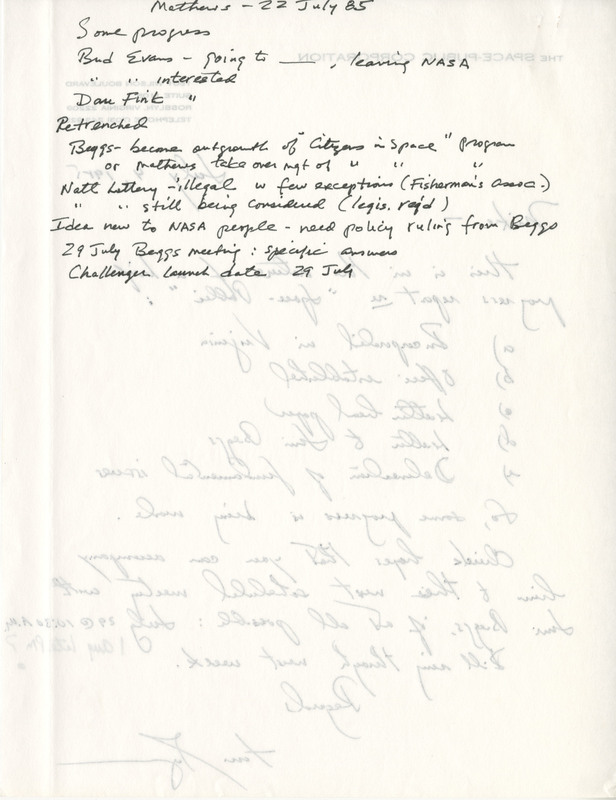 Written by John H. Craigie, with handwritten notes from Collins. 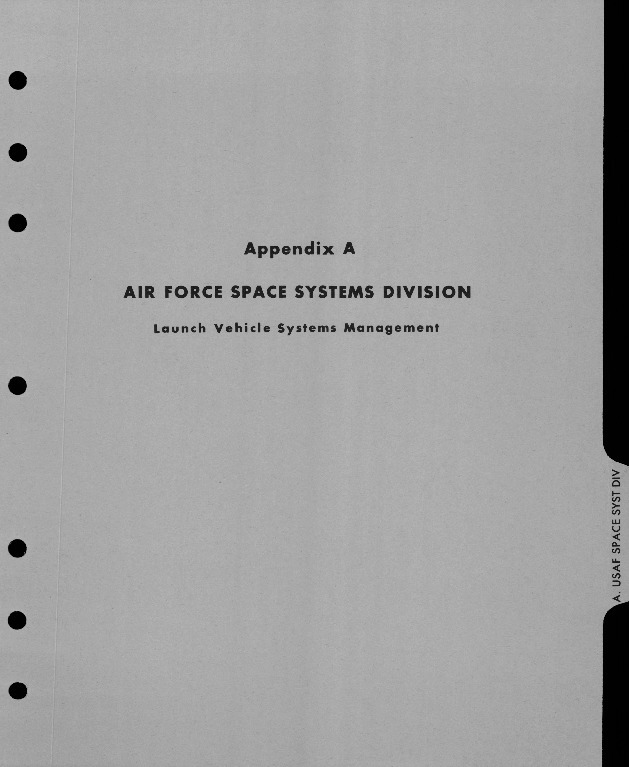 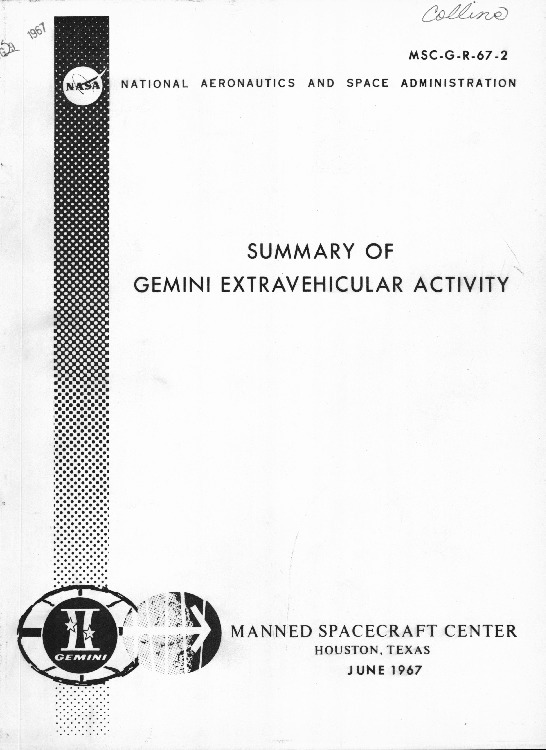 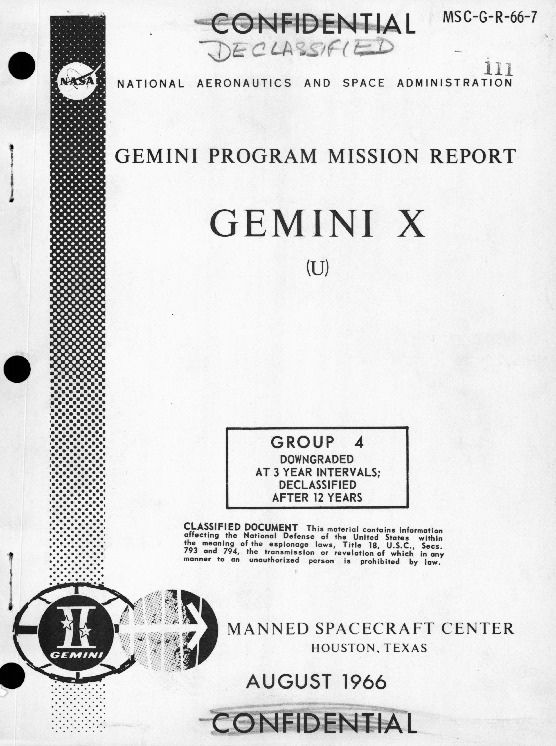 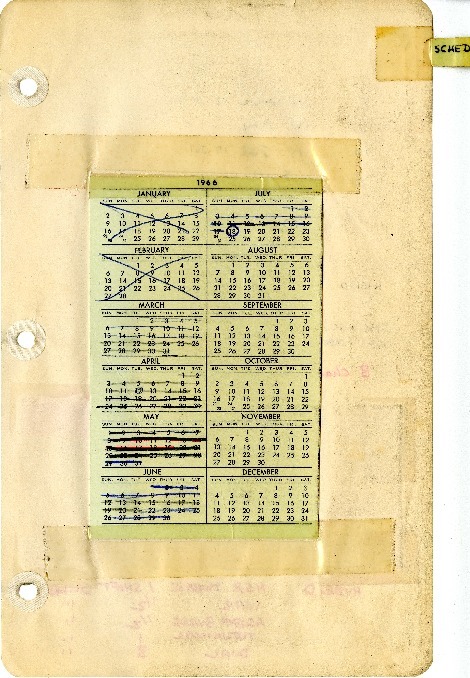 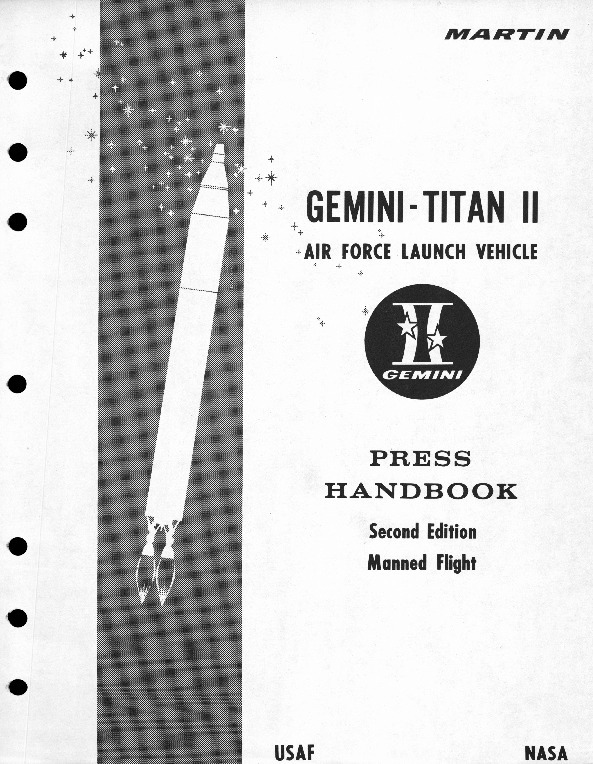 Gemini Training Notebook, 1963-1964. 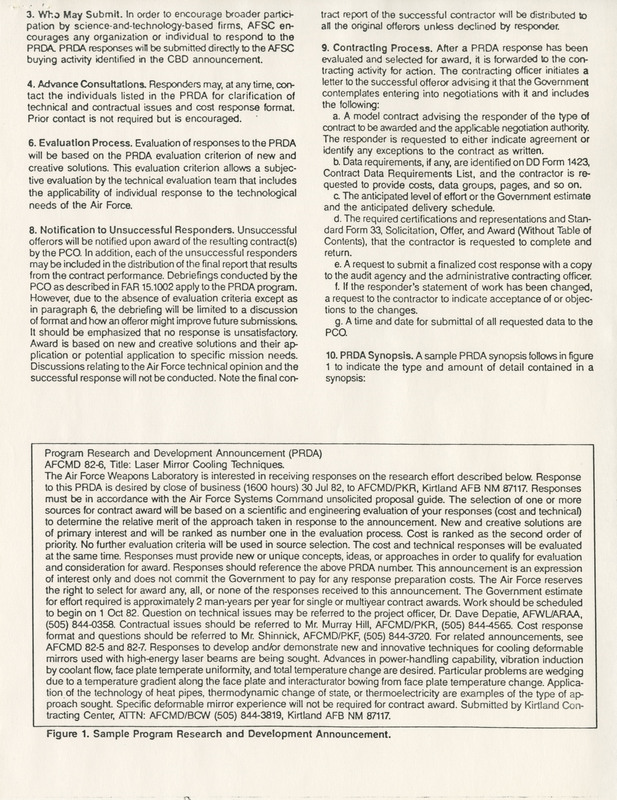 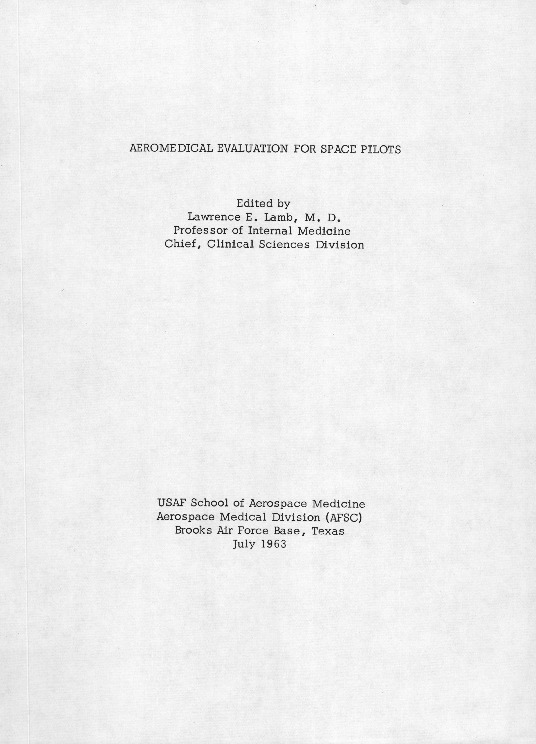 Collection of notes, papers, and articles. 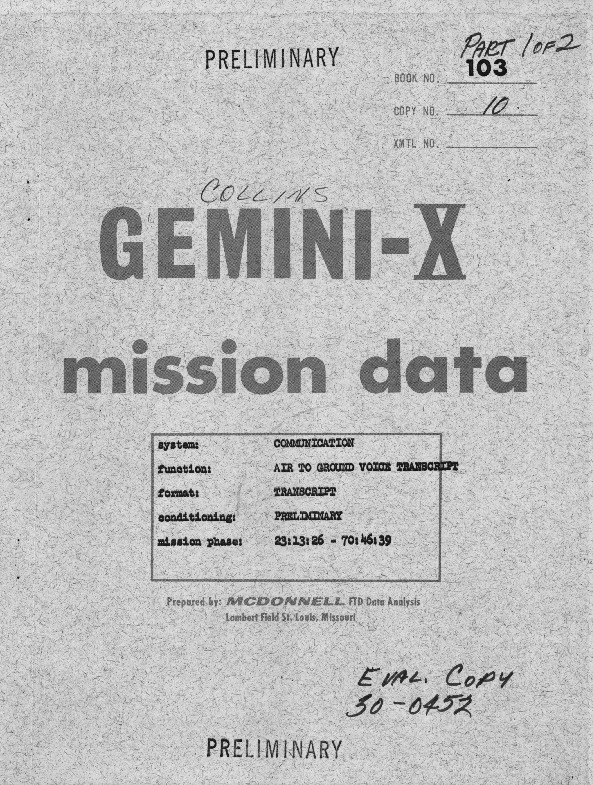 Michael Collin's Notebook for the Gemini 10 Mission, c. 1966. 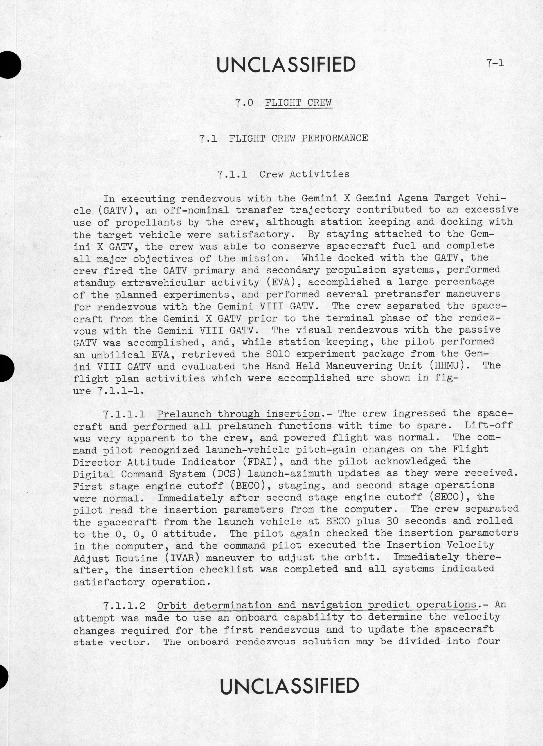 A collection of handwritten notes and various documents and charts. 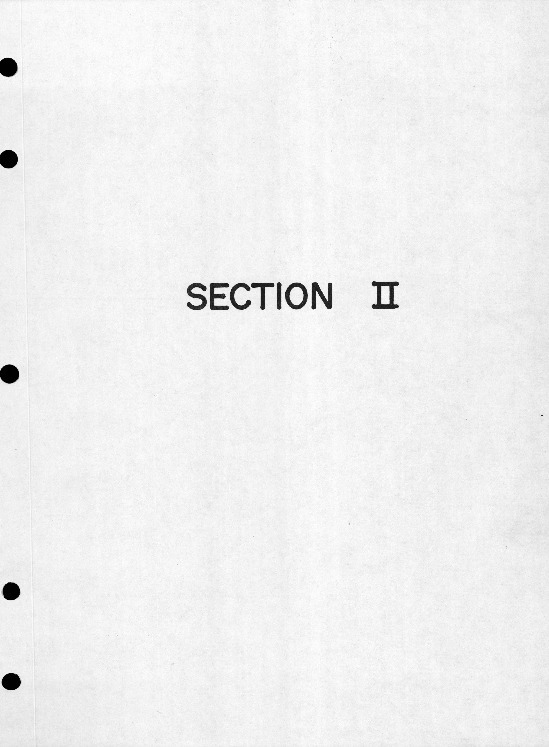 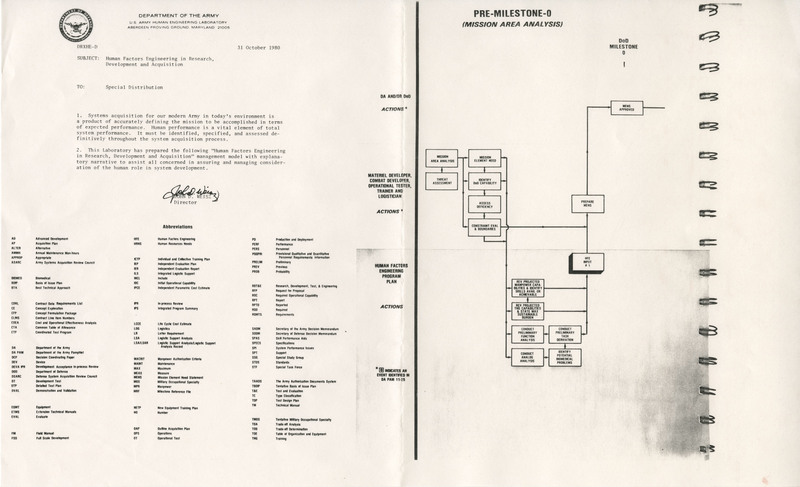 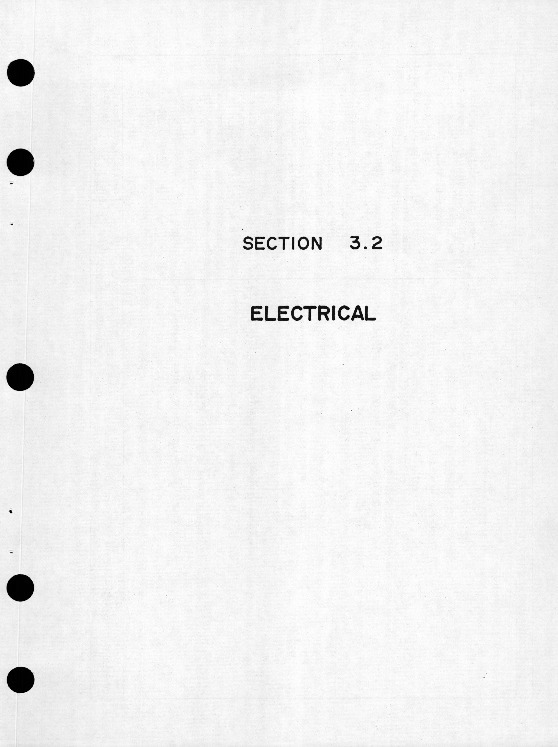 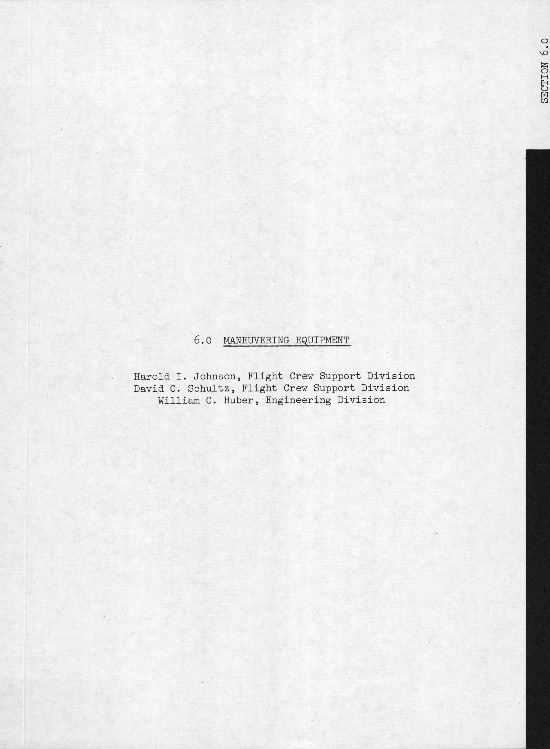 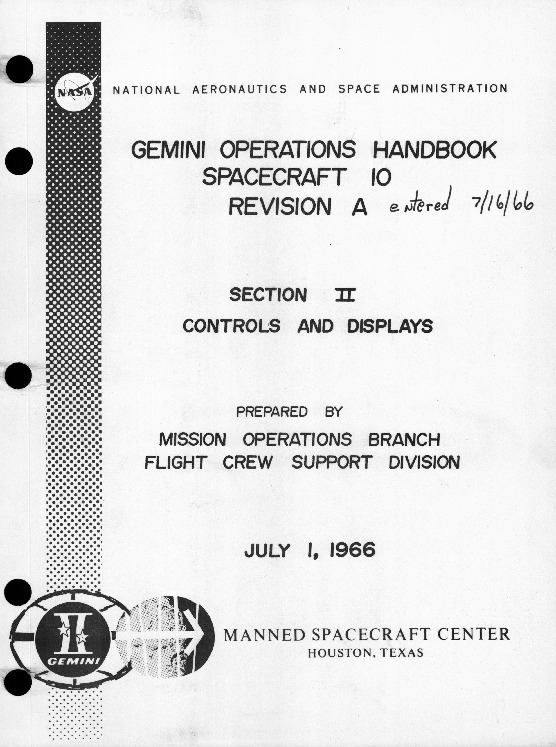 Part 1 of 3 of Section II (Controls and Displays) from the Operations Handbook for the Gemini 10 mission, July 1, 1966. 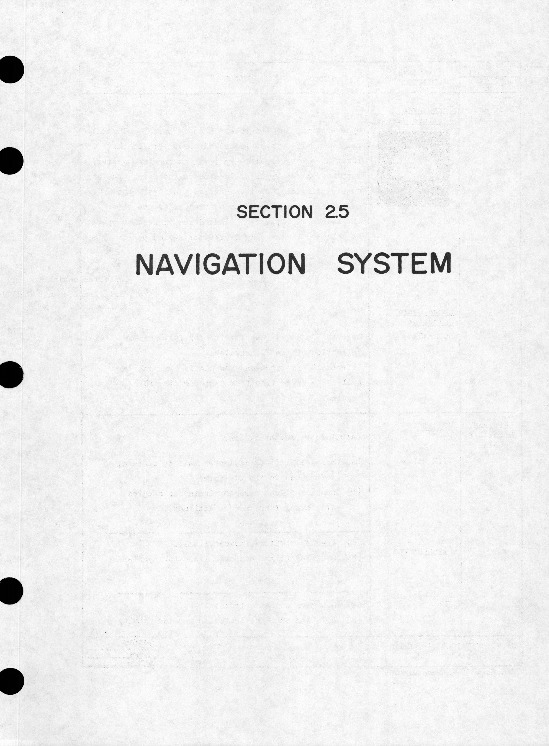 Part 2 of 3 of Section II (Controls and Displays) from the Operations Handbook for the Gemini 10 mission, July 1, 1966. 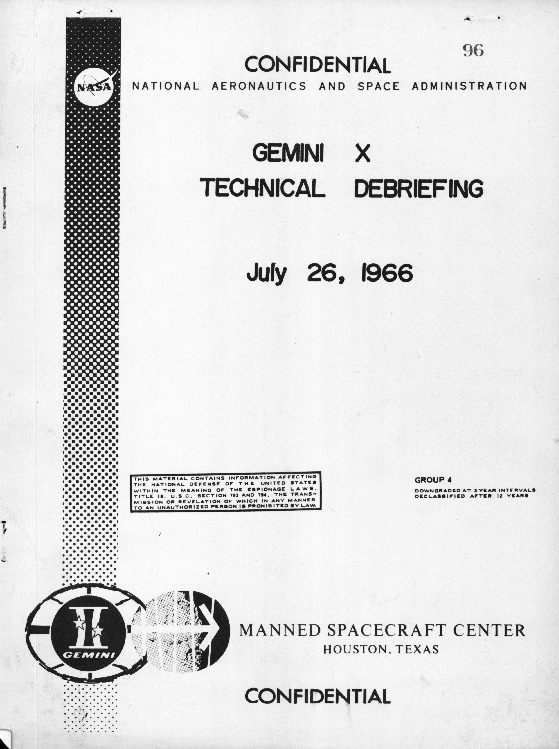 Part 3 of 3 of Section II (Controls and Displays) from the Operations Handbook for the Gemini 10 mission, July 1, 1966. 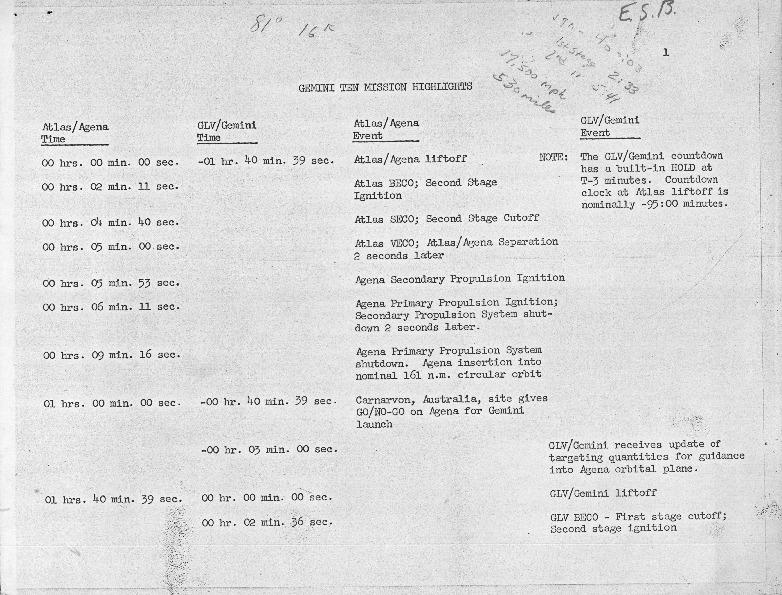 Transcript 1 of 2 of the air-to-ground, ground-to-air audio recording from the Gemini 10 mission, July 18-21, 1966. 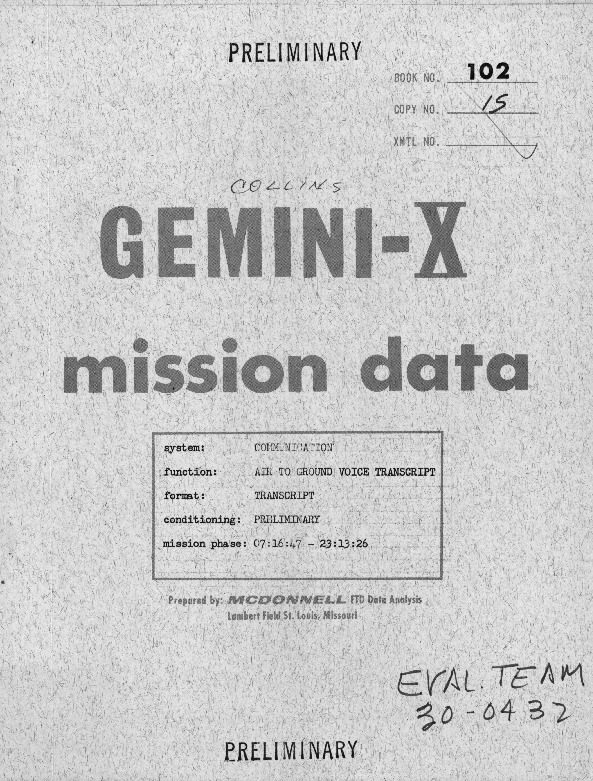 Transcript 2 of 2 of the air-to-ground, ground-to-air audio recording from the Gemini 10 mission, July 18-21, 1966. 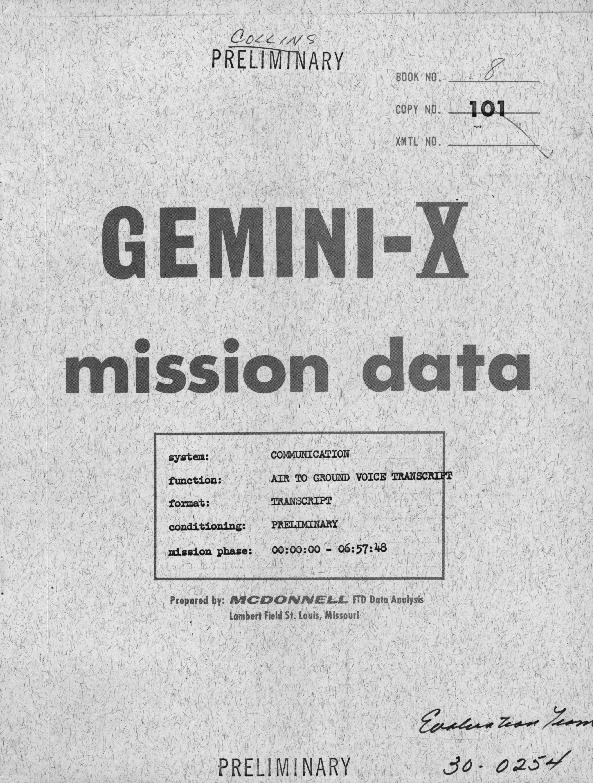 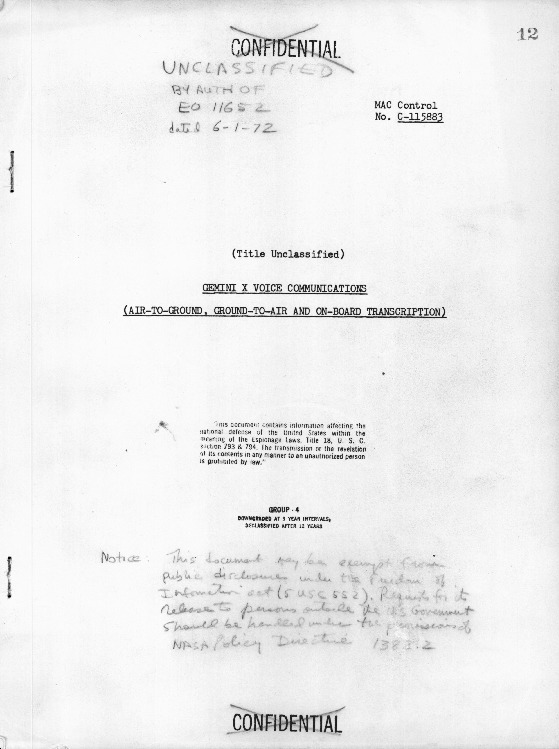 Transcript 1 of 2 of the Gemini 10 mission Air-to-Ground voice communications, July 19-21, 1966. 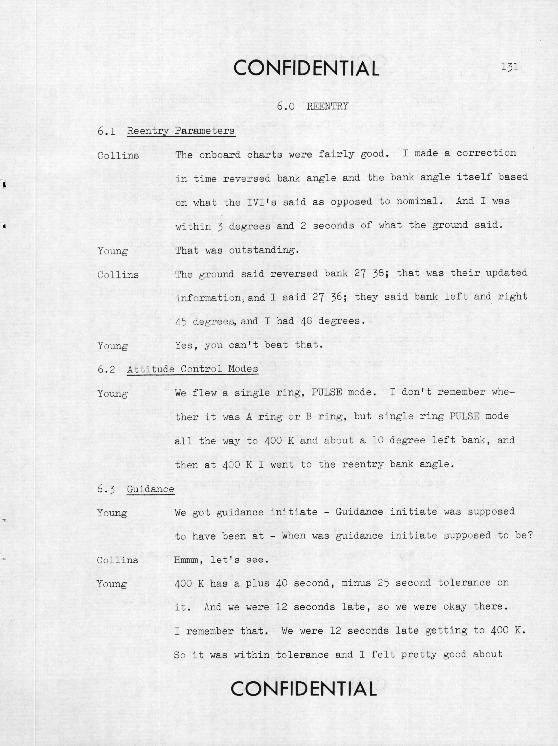 Transcript 2 of 2 of the Gemini 10 mission Air-to-Ground voice communications, July 19-21, 1966. 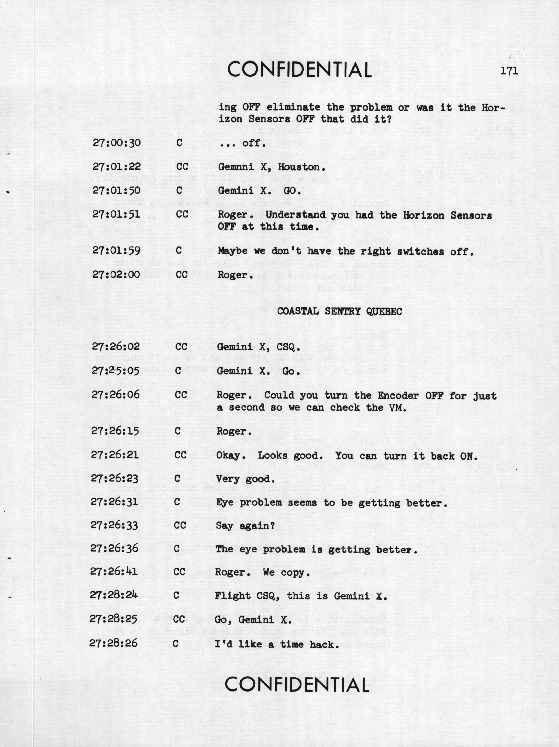 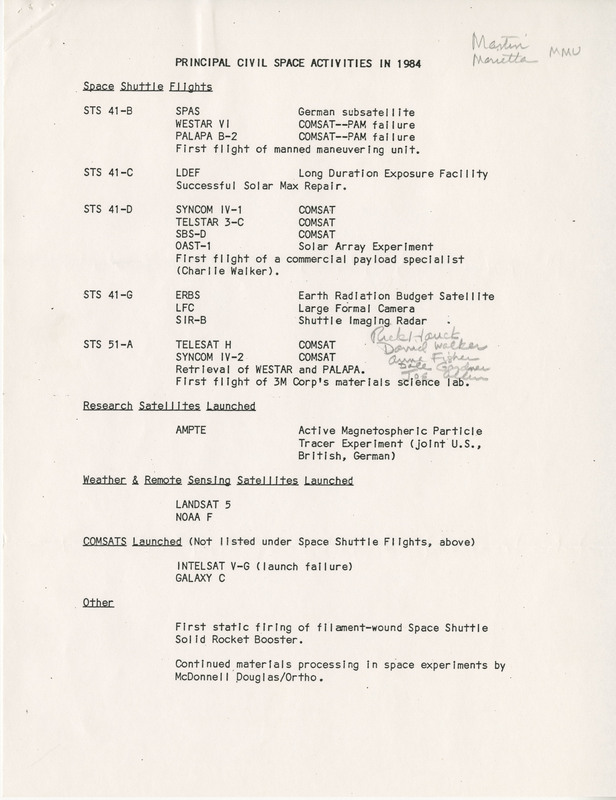 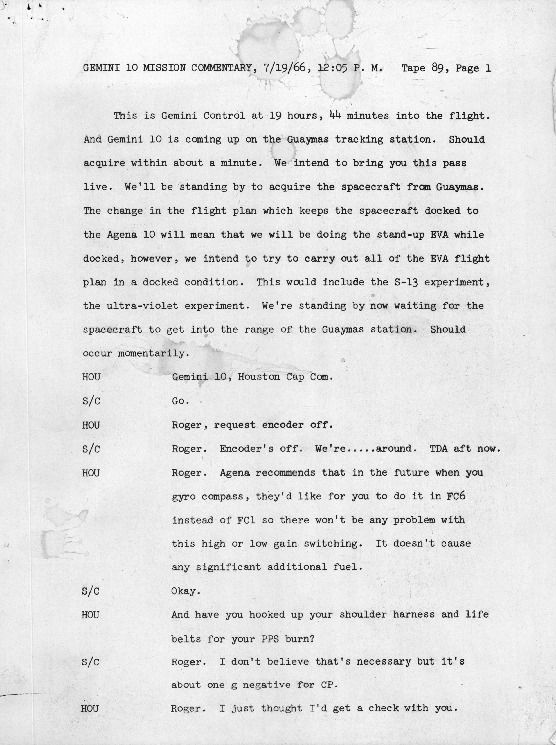 Transcript of the Gemini 10 Mission Commentary, July 19, 1966. 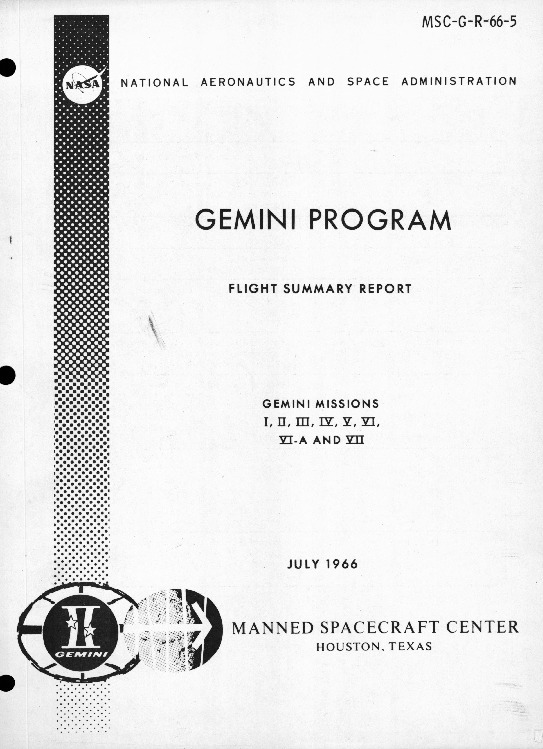 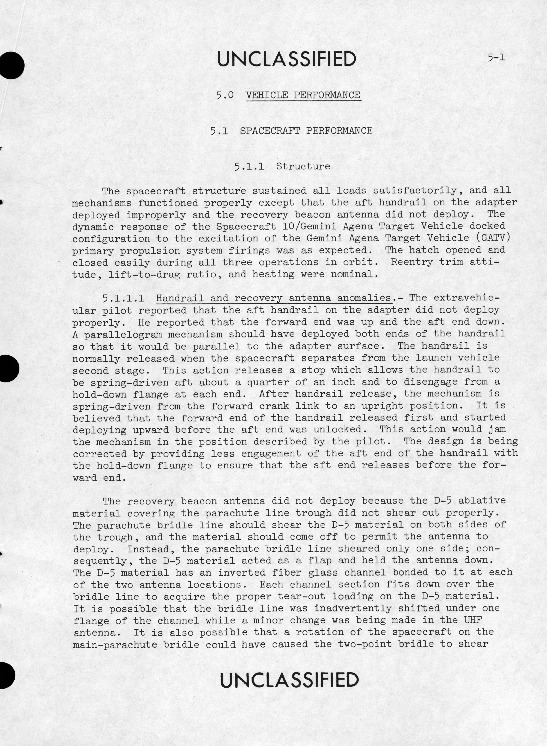 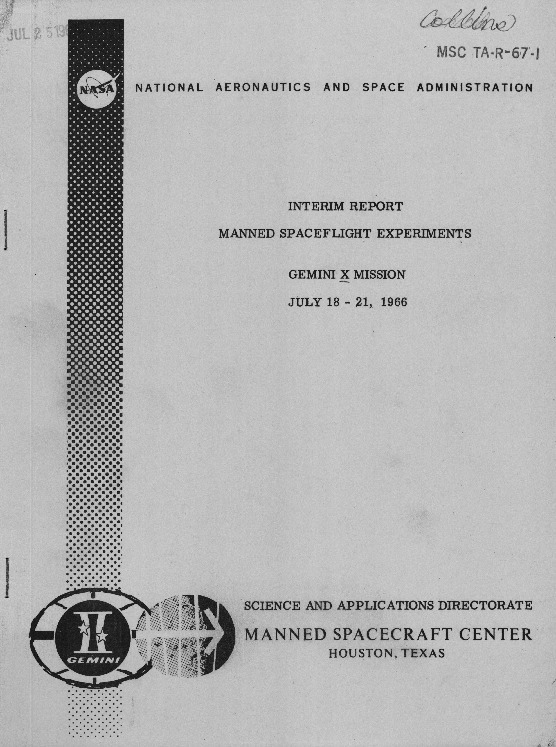 Part 1 of 3 of the Gemini 10 Program Mission Report, August 1966. 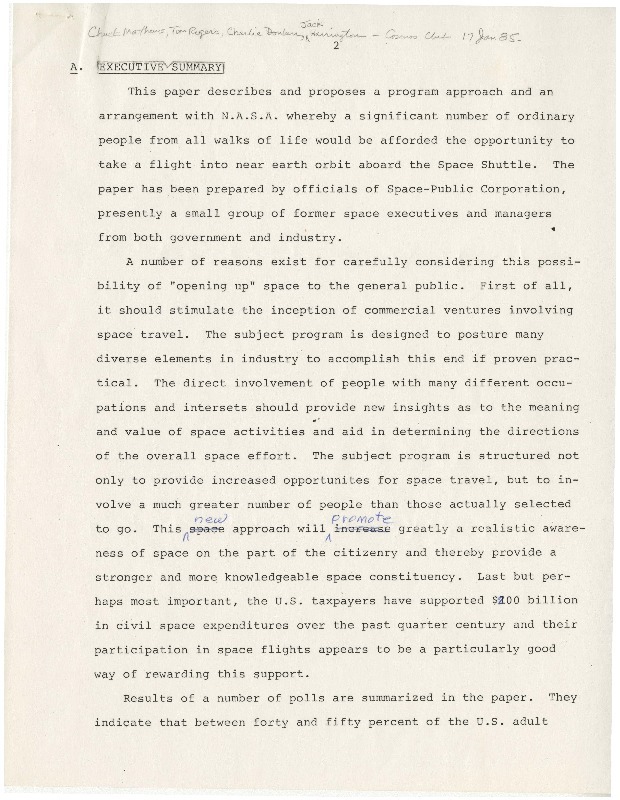 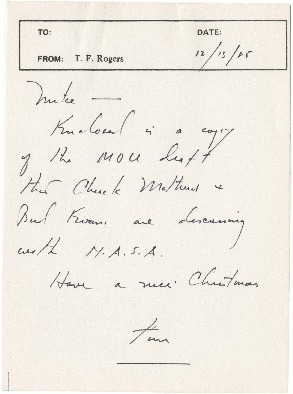 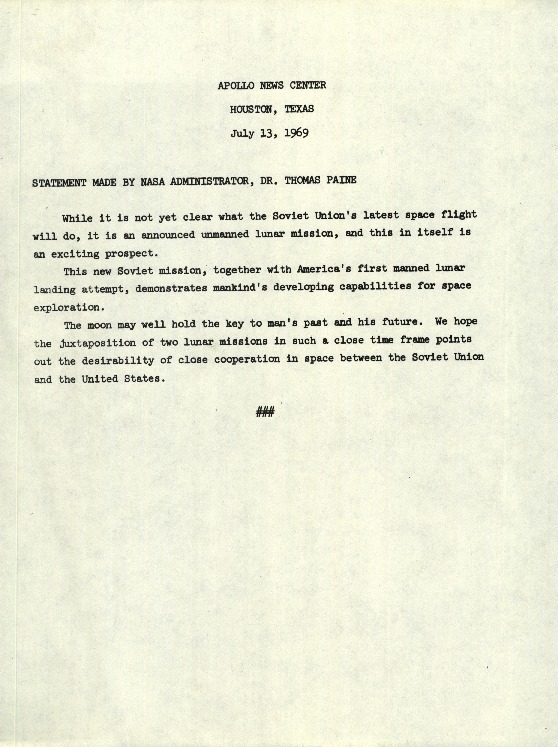 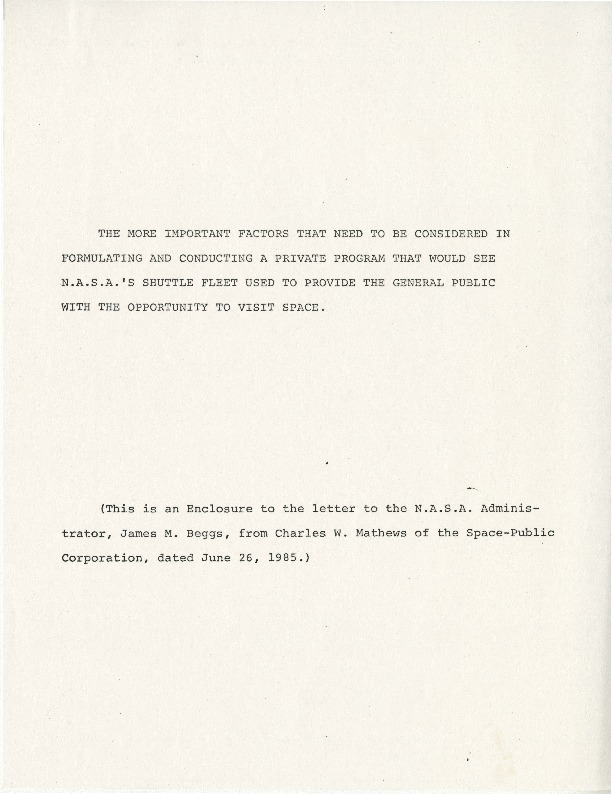 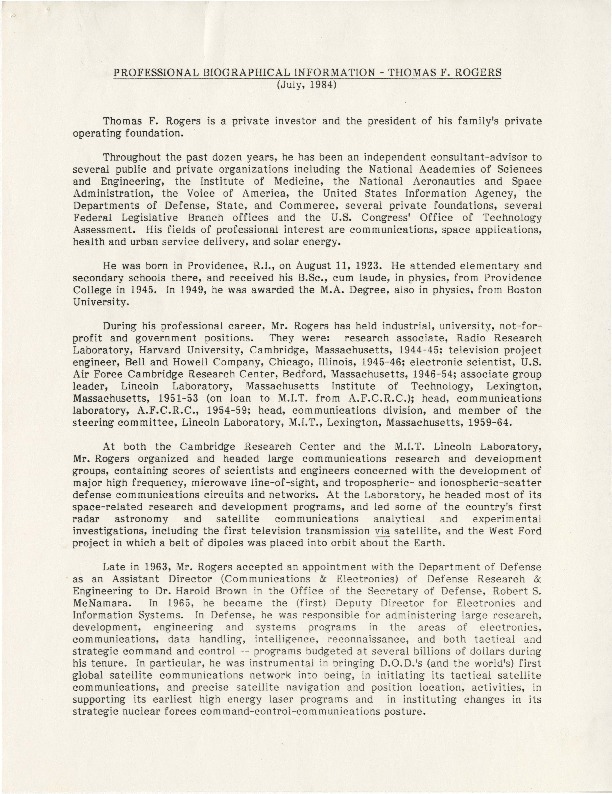 Collection of Press Releases from NASA between July 13-24, 1969.